The Hawks created seven more turnovers than the Bulldogs and scored 12.6 (78) to 5.6 (36) from this source. Thirtyeight of the turnovers the Hawks created were in their forward half and they scored 6.5 (41) from these. The Hawks won the ball at the contest and scored 6.5 (41) to 3.3 (21) from stoppages. Fiftysix per cent of the match was played in the Hawks' forward half. They won disposals 476-320, contested possession 147-124, clearances 39-34, tackles 67-54 and inside 50s 61-41. 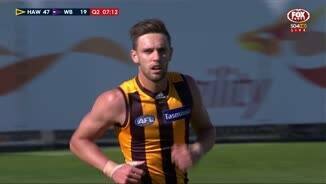 Jonathon Ceglar's 19 disposals is yet another careerhigh for a Hawks player. His previous high was 17 v Gold Coast in round 4, 2014. Taylor Duryea has had 28 disposals, also a careerhigh. His previous high was 21 v the Saints in round 20, 2013. Isaac Smith's 32 disposals is also a careerhigh. His previous high was 31 v the Magpies in round 23, 2014. 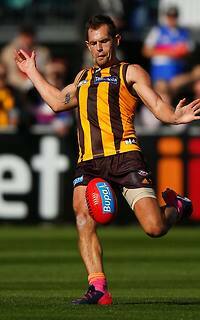 Luke Hodge now has a careerhigh 41 disposals. Jarryd Roughead wins his fourth clearance which launches the Hawks' fourth goal from stoppages. Roughead now has a careerhigh 16 score involvements. 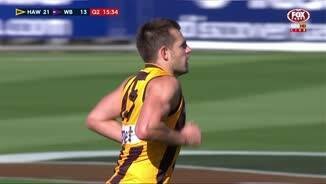 Hawthorn InterchangeJed Anderson was substituted into the game for Paul Puopolo. The Hawks have gone inside 50 four times from eight kickins and scored 1.2 (8) from these. The Bulldogs have gone inside 50 once from 10 kick-ins and failed to score. Jarryd Roughead is up to 15 score involvments - an equal career-high. Jarryd Roughead is up to 14 score invovlements. His careerhigh is 15 v the Lions in round 1, 2014. Luke Hodge has 37 disposals to threequarter time - a career-high to this stage of a match. His previous best was 33 v the Magpies in round 15, 2011. He needs four in the fourth quarter for a career-high in a match. The Bulldogs won clearances 124 and inside 50s 17-12 in the third quarter but were outscored 2.5 (17) to 3.1 (19). Tom Boyd has grabbed four marks inside 50a career-high. 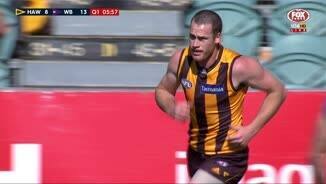 Jarryd Roughead has three for the Hawks, who lead marks inside 50 16-7. The Hawks have created three turnovers in their forward half this quarter and have scored 1.1 (7) from these. The Bulldogs have scored two behinds from four forward half turnovers. Taylor Duryea wins an intercept possession in the Hawks' defensive 50 which launches their second goal for the quarter. The Bulldogs lead clearances 71 and inside 50s 11-2 this quarter but have scored only 1.4 (10) to 1.0 (6). Western Bulldogs InterchangeStewart Crameri off due to an injury. Bulldogs InterchangeStewart Crameri off due to an injury. The Bulldogs have won the only two centre clearances this quarter and have scored 1.1 (7) from these. The Bulldogs score three behinds from the first three inside 50s of the quarter and the Hawks score a goal with the fourth, their first. Bulldogs InterchangeMitch Honeychurch off due to an injury. Bulldogs InterchangeDale Morris off due to an injury. 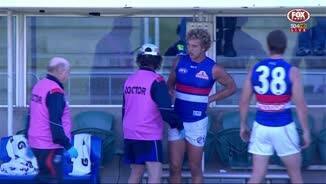 Bulldogs InterchangeMitch Wallis and is possibly out for the game. Hawks InterchangeIsaac Smith off due to an injury. Welcome to Aurora Stadium for the Hawthorn v Western Bulldogs Round 3 clash. 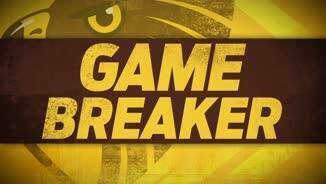 LUKE Hodge has led Hawthorn to a convincing 70-point win over an injury-depleted Western Bulldogs side in Launceston. The Hawks' skipper put in a masterful performance, with 44 possessions and two goals in the 19.13 (127) to 8.9 (57) win, with Jarryd Roughead also a key contributor up forward with seven goals. The Bulldogs suffered a heavy injury toll in their first loss of the season. 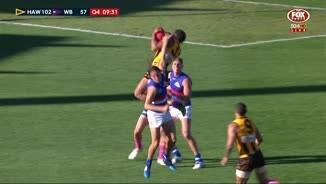 Matthew Boyd (calf) and Marcus Bontempelli (calf) dropped out of the side before the match, but then Luke Beveridge had to contend with the losses of Dale Morris (pec) and Mitch Wallis (back). "Morris has a pectoral injury, Wallis has something gone on with his back, he copped a knee," Beveridge told reporters in Launceston. "They'll be out for a while, I don't know how long, but they're not minor injuries. "They won't be playing next week." Morris was subbed out, but the Dogs were one player down on the bench when Wallis couldn't return after copping a heavy knock in the first term. 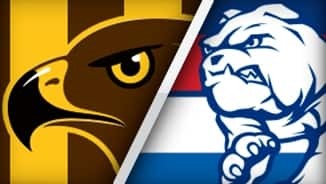 The Bulldogs had first use of a stiff breeze, but still trailed by two points at the first break, and Hawks coach Alastair Clarkson was particularly pleased with the way his side held the Bulldogs early. "We were really pleased with our start," he said. 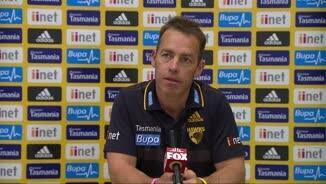 "To have as many inside 50s against a pretty stiff breeze in the first quarter and actually win on the scoreboard was really pleasing. 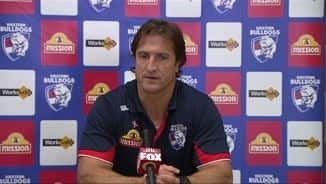 "To end up with a significant victory like we did in terms of final winning margin was really, really pleasing, bouncing back strongly from our loss last week against the Bombers." Hawthorn put the wind to better use in the second quarter, with Roughead adding three goals as the Hawks sprinted away to lead by 35 points at half-time. 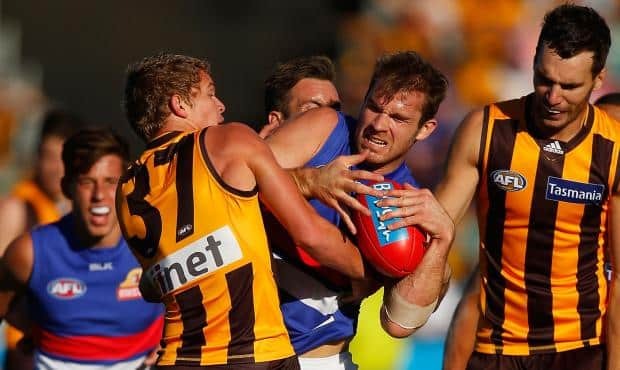 With the wind at their backs once again in the third quarter, the Dogs were unable to make any inroads into the margin, which blew out in the final term when the Hawks booted five goals to none. Luke Dahlhaus (28 possessions) worked hard for the Bulldogs, with Robert Murphy also important with 24 touches. Hawthorn had contributors across every line with Jordan Lewis (41 possessions) and Isaac Smith (36) prominent. Cyril Rioli added to his personal highlights reel with two spectacular marks in the final quarter. Bradley Hill failed to shake off the after effects of the heavy knock he received against Essendon last week and was a late withdrawal for Hawthorn.